I am referring to the Coiled Filigree Earrings by Emily. Tried out the project yesterday. Well, I didn't follow through the tutorial. Reason being I got flooded with other ideas halfway through the project. First, while making the hoop, I decided to change it from dangle to hoop earrings. The size of the hoops are maintained at 2.5cm in diameter. Then, when the coils were completed, and I was getting ready to attach it to the bottom of the hoop, another idea came to mind. Ermmmm....how would it look like if attach to the inside of the hoop instead? The beads, coral and pearl were wire wrapped to the bottom. How do you like my version of the Coiled Filigree Earrings :)? 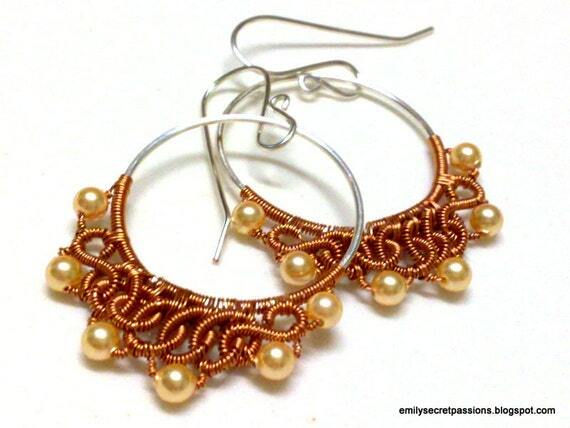 If you would like to learn how to make a Coiled Filigree Earrings, check out Emily's Tutorial here. Who knows you might be flooded with more ideas than me. Emily, thanks for the inspiration.